When you hear aquarium islands, what do you think? You might think of the floating island with plants that frogs hang out and eat on at the top of your fish tank. But after reading this you might have a completely new idea of what a real aquarium island is. The great island of Atlantis was said to have sunk into the sea over 11,000 years ago. Before it sunk to the bottom of the sea it was a nation rich with plants, herbs and thousands of animals. We like to keep the spirit of Atlantis alive with our underwater aquarium island that is available for any fish tank. The incredible part about this island is that animals and plants can still live and thrive even though they are at the bottom of your aquarium. This is made possible because it is an underwater biosphere that is filled with air instead of water. Think of a big bubble at the bottom of your fish tank. Now imagine holes in the bottom where air is allowed to push out all of the water inside the bubble leaving only fresh air. Also imagine all of your semi aquatic animals climbing into the dry land. It is a very fun sight. With aquarium islands like ours, your amphibians can eat, breath and rest in their natural habitat. 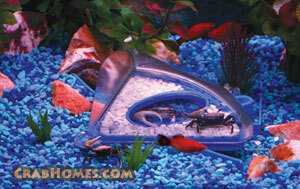 They get their food by this special Feeder Tube that is placed in the tank and the aquarium island. Food is forced down the tube with water and it lands perfectly inside of the island. There your amphibians will have fun hunting down their food, just like in the wild. And, it is very fun to watch. Atlantis Underwater Islands is the best way to turn your fish tank into a masterpiece. It turns the ordinary aquariums into a complete underwater world. You can have fish, frogs, news, turtles, salamanders, and crabs in the same tank at the same time. They thrive together.